← Waitress- Pantages Theater – Friday August 3, 2018 – Hollywood, CA. 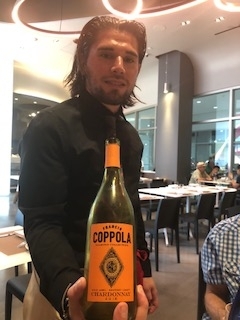 Re-Visit Drago Restaurant – August 9, 2018 – Lunch – The Petersen Museum – Los Angeles, CA. One of the things that I love about all things Drago is how unique and fresh all of their food is. 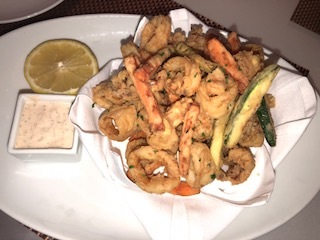 Each dish is made to order by Chef Juan Carlo, but you will find this at all of their Los Angeles restaurants, made fresh to order by their various chefs. It is astounding how many restaurants they have and their quality control is off the charts. I have never had a bad meal at any of their restaurants. Drago is just simply the best Italian in my immediate area. 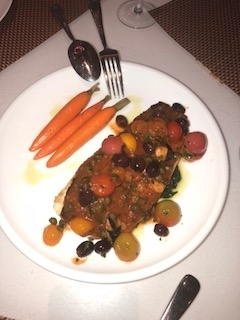 Each and every dish has its own unique flavors that are all about the best, freshest Italian ingredients. Housed inside The Petersen Automotive Museum, Drago Restaurant will give you a welcomed break from all of the new and vintage cars that you will see on your visit. Drago also does all of the onsite catering for their many events at The Petersen. Bartender Marvin made me some terrific starter cocktails both with Vodka, both truly delicious. When I asked Marvin for a name, he said call them Marvin’s Connection. 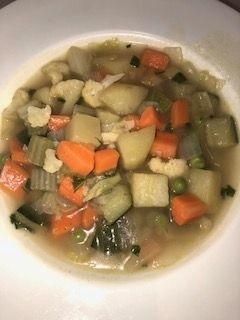 Minestrone, Assorted vegetable soup. I can always know if a restaurant is going to be good by their soup. This is the platform of all cooking in my food 101. This soup was delicate and simple, but just hits the spot. 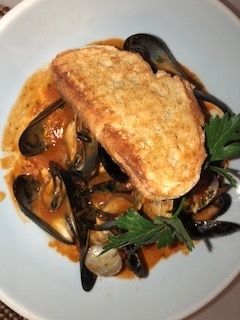 Cozze E Vongole, Salt spring mussels, manila clams, spicy tomato broth, toasted garlic bread. A lovely fragrant red sauce with nice texture, this appetizer is a must. Calamari Fritti Con Verdura, Fried calamari and vegetables, lemon capers tartar. This lemon tartare sauce makes the whole dish, it is fragrant and smooth. 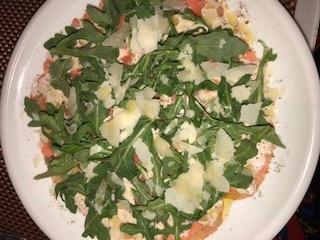 Carpaccio Di Bue, Scaglie Di Parmigiano, Mostarda, Beef Carpaccio, shaved parmesan cheese, and mustard dressing. The meat is raw, but super tasty, coupled with the mustard and the cheese, truly a winner. Cesar, Caesar salad, romaine lettuce, Parmesan cheese, croutons with prawns. The lettuce is super crisp, with a nice hint of anchovies, really fantastic. 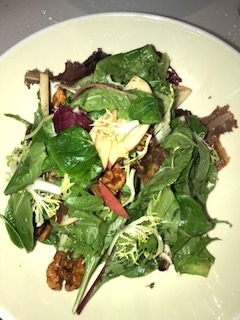 Mele E Indivia, Baby mixed lettuce, pink lady apple, bacon, candied walnuts, and champagne vinaigrette. The apple, candied walnuts and bacon melts in your mouth. The delicious champagne vinaigrette adds the right amount of acid, all in all a keeper. 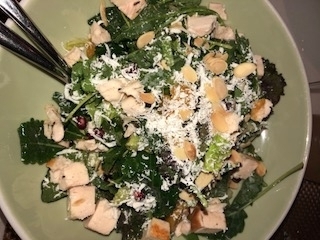 Kale, oranges, pomegranate, avocado, almonds, focaccia, croutons, yellow beets, dry ricotta, champagne vinaigrette with chicken. Kale is all the rage, but what makes this salad so enticing is the oranges with the ricotta cheese. 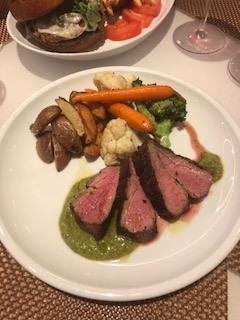 Tagliata Di Ue E Salsa Verde, Pan roasted Flank steak, herbs sauce, seasoned vegetables. Cooked rare, with great flavor, the salsa verde adds just the right amount of tang to the mix. 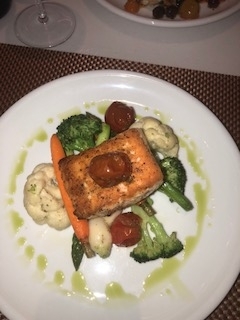 Salmone, Pan roasted Salmon, season sauté vegetables. The salmon is crusted but flaky and light. The seasonal vegetables are cooked al dente but add a nice texture to the plate. 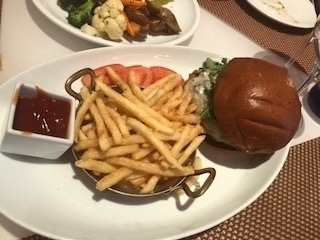 Burger, Prime beef burger, caramelized onions, Portobello mushrooms, Fontina cheese, truffle butter, and truffle fries. Possibly the best burger ever, the caramelized onions seal the deal for me. Bucatini Carbonara Con Piselli, Bacon, peas, egg yolk, cream, Parmesan cheese. This is always one of my go to pasta dishes when I go to Italy. At Drago, it is done old school way, so amazing. Fettuccine Alla Bolognese, Fettuccine with meat sauce. 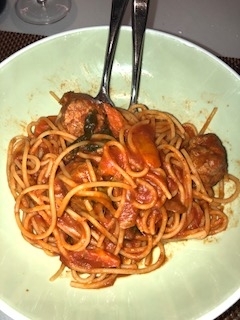 Another one of my pastas that I crave, this sauce had a nice mushroom, cinnamon essence, which added to the overall experience. Spaghetti Con Polpette, Spaghetti with meatballs and tomato sauce. Traditional menu item, more Italian American then typical Italian style dish. Spaghetti Frusta Di Mare, Shrimps, calamari, bay scallops, mussels, clams in a light tomato sauce. The shellfish is very fresh with a wonderful aromatic flavor. 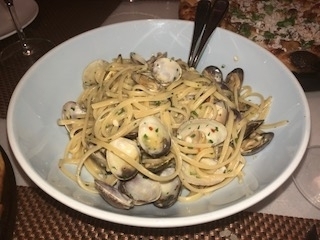 Linguine Vongole fragrant, Linguine, clams, garlic, fresh parsley. Lots of little clams, the very light sauce is filled with garlic. Lasagne Bolognese, Baked meat lasagna. Done in a little casserole dish with béchamel sauce baked on the top. This is very delicious lasagna. 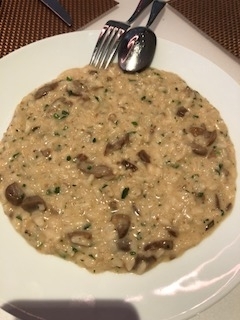 Risotto Porcini e Mascarpone, Risotto with porcini mushrooms and mascarpone cheese. If this is done right, it will be the best thing you ever put in your mouth. The combination of the mushrooms and the mascarpone cheese is pure heaven in your mouth. Siciliana, Eggplant, smoked mozzarella, basil, shaved ricotta. The crust is thin, with an ideal sauce, for a pizza lover this would be the place you would want to have a real authentic pizza. 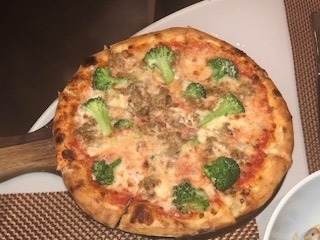 Barese, Sausage, broccoli, mozzarella, Parmesan cheese. A more robust pizza but does deliver. 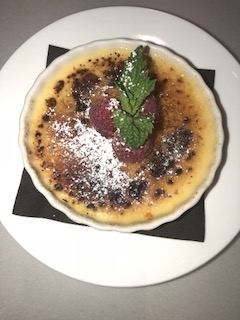 Lemon Crème Brule, light, smooth, just what the doctor ordered as a final touch to this unbelievable lunch!! 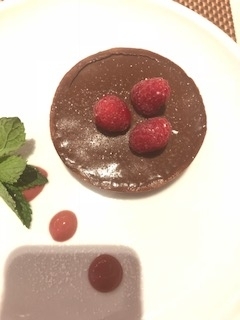 Chocolate Tart, a wonderfully rich and perfect dessert item. Reims, France NV. The magical rise of the bubbles lifts your spirits; the clinking of the glasses is music to my ears, a lovely way to start my experience. Rose of Pinot Noir, Main and Geary Sonoma 2015. This is the go to rose. The trend now is people drinking a lot of Rose, and this one does not disappoint. I loved this wine with the calamari, it was the perfect marriage of flavors. 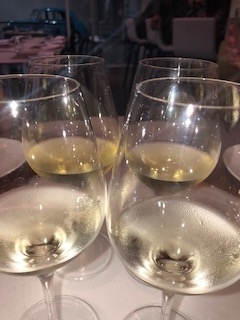 Sauvignon Blanc, Cake Bread Cellars, Napa Valley, 2016. I just love this wine. The brand is always great and the quality matches the label always. Chardonnay, Ronco del Gelson, “ Sietvignis”, Fruili, Italy 2014. This was a nice blend of creamy and fruity, it went great with the Linguine Vongole. Due Data, “Pietro Caciorgna”, (Celestino Drago Selection) 2016. I can understand why this would be a Celestino Drago selection, it is simply fantastic. It is the wine to drink with the delicious burger. Brunello di Montalcino, Fattoria dei Barbi, Toscana, Italy 2014. This is by far my favorite Italian wine, the perfect combination with the flank steak. 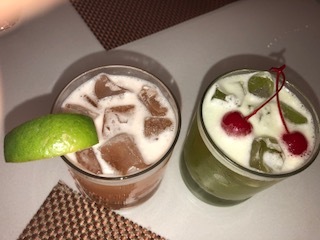 Server Alfonso Ochoa and Hostess Sabrina were the most welcoming pleasant staff members that truly guided my experience in a very positive way. If you want real, delicious, authentic food in Los Angeles then this is the place to go. I am always a huge fan of anything Drago. I just love how wonderful the food is and how much effort they put into every dish. 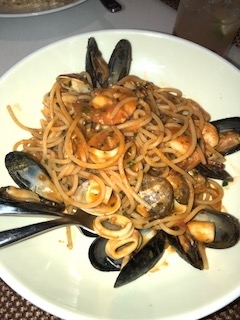 Born and raised in the Messina area of Sicily, the four Drago brothers, Celestino, Tanino, Calogero and Giacomino have owned and operated some of the Los Angeles area’s most prolific Italian restaurants. 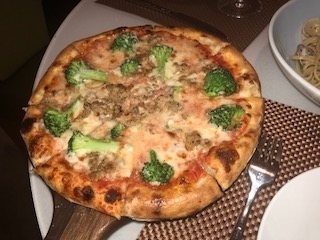 Featuring hand-cranked pastas, pizza, fresh-baked bread and more, Drago Ristorante offers elevated, yet authentic Italian fare and a heavy dose of classic Italian hospitality that the Drago brothers have been providing Angelinos and visitors alike for over three decades. Experience contemporary Italian cuisine from the Drago brothers, alongside some of the rarest and most valuable cars in the world inside the Petersen Automotive Museum. Hours: Sunday – Friday: 11:00am – 6:00pm Saturday: 11:00am – 6:00pm- Last reservation accepted for 4:30 p.m.